What Is A Secondary Market Sovereign? What Is A Newly Minted Sovereign? What Is A Premium On A Sovereign? How Much Is A Sovereign Worth? Why Are Some Sovereigns More Yellow Than Others? Are One Ounce Gold Coins A Better Buy? It depends. If you are looking to get the most gold for your money, old sovereigns (secondary market sovereigns) sold as bullion coins are the best option for gold investors. These are closely followed by newly minted bullion sovereigns. Secondary Market sovereigns are also referred to as pre-owned or second hand sovereigns. They mean the same thing; they will not be new. 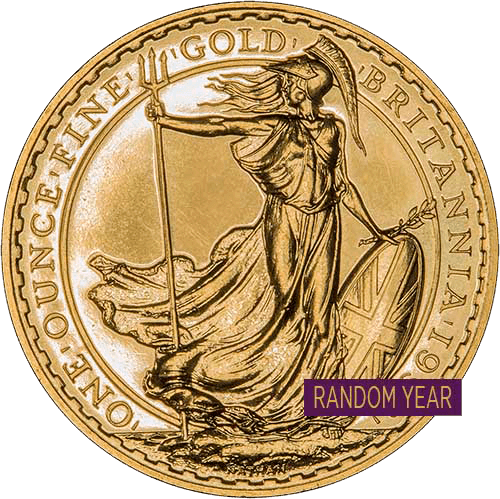 Sovereigns used to be issued for circulation as a one pound coin. Until the middle of the First World War, these British gold coins were used the same way you would pay for goods or services with a modern pound coin. Sovereigns were issued at international branch mints for use overseas and mintage figures would be released for each mint. In 1932, Great Britain left the Gold Standard and production was stopped. Britain reintroduced the sovereign briefly between 1949/51 and started production of sovereigns for investment again in 1957. They have become one of the world's favourite gold bullion coins. As time passes, there are fewer higher quality old sovereigns available. As sovereigns were used as money, banks would remove coins from circulation if they contained less than the specified gold content or were damaged. Many sovereigns were also melted down or sent to America to pay the cost of the UK's war effort for both World War I and World War II. There was also a trend where sovereigns were made into jewellery, further reducing the number of coins in circulation. Secondary market sovereigns may include coins which bear portraits from Victoria Young Head to Elizabeth II. You may even get some recent issue sovereigns bearing the fifth definitive UK coin portrait of Elizabeth II if we feel that they are not good enough for us to sell as Newly Minted Sovereigns. 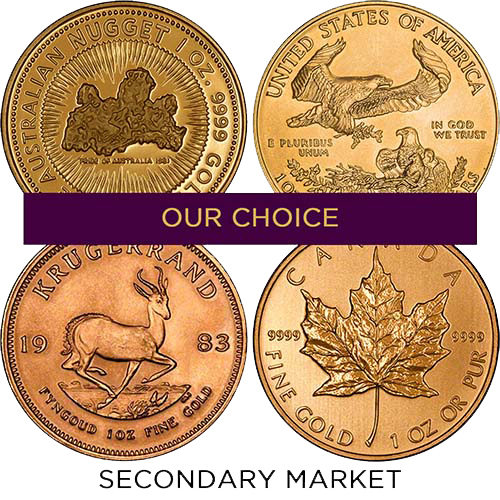 Our Secondary Market Sovereigns are our choice of date coins. These are chosen at random from our available stock at the time of ordering. These sovereigns are one of our most popular investment gold coin products. You can buy from 1 to 1,000 (if you require more, ask for details). On occasion, we may need to source these sovereigns from the second hand market in order to fulfil your order. This allows you to fix at the live gold price for future delivery. Secondary market sovereigns will have signs of wear; they may be worn, scratched, have bagmarks or edge knocks. However, if they are very worn or damaged, we will scrap them or sell them as Grade C sovereigns. 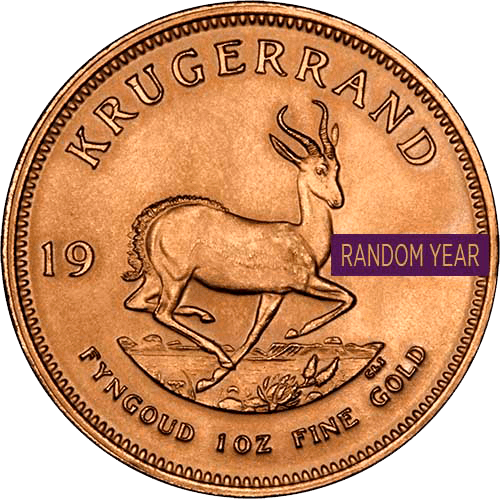 They are an interesting gold bullion choice for investors who are looking for numismatic and collectable coins. 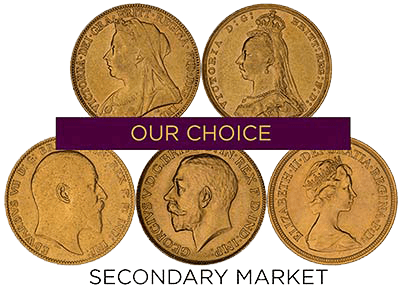 Our Best Value secondary market sovereigns are usually selected from a variety of dates and mint marks and you may receive a mixture of portraits of different monarchs. We particularly like the fact that these gold coins will have passed from hand to hand. If only they could tell their story, it would be fascinating. Newly minted sovereigns are sovereigns which have been minted recently. We sell Best Value Newly Minted Sovereign which are selected from available stock dated between 2000 and now. There are investors who prefer a new coin, so newly minted sovereigns are their best choice. Recent modern sovereigns are issued with unlimited mintages and, on the whole, do not have the same collector interest as the older sovereigns. If you prefer this year's sovereign you can specify this date on your order. When sovereigns are minted, they are uncirculated. You can find old sovereigns which are uncirculated but they will be classed as a collectable sovereign and will attract a higher price. Modern sovereigns issued after 2000 tend to be referred to as uncirculated sovereigns. These are sovereigns which are sold as investment gold at a low premium above the intrinsic metal value. They may have some light scratches, scuffs or 'bagmarks' where they have been stored next to each other. 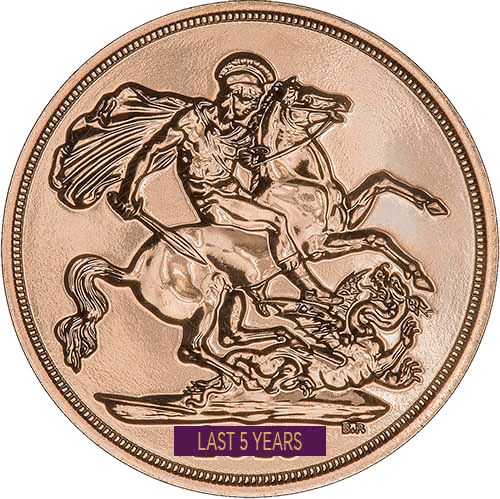 Between 2000 and 2013, uncirculated sovereigns were issued by the Royal Mint in blister packaging. 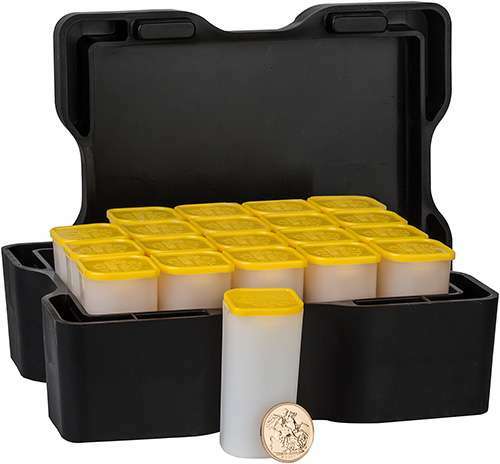 From 2014 to now, the uncirculated sovereigns are issued to trade in tubes of 25 coins. We receive 500 coins in a complete monster box which is ideal for investors looking to buy large amounts of gold bullion. The premium is the percentage that you will pay on top of the intrinsic metal value. 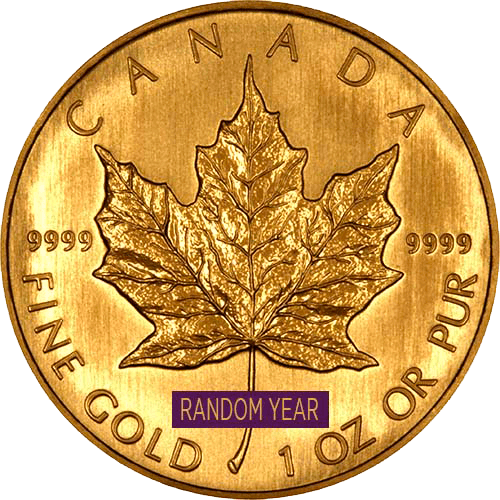 A sovereign contains 0.2354 troy ounce of gold. If the live gold price is at £1,000 per troy ounce, the intrinsic metal value of the sovereign would be £234.50. If the premium is 3.5%, you will pay £242.70 per sovereign. You will see that the more you buy, the lower the premium. 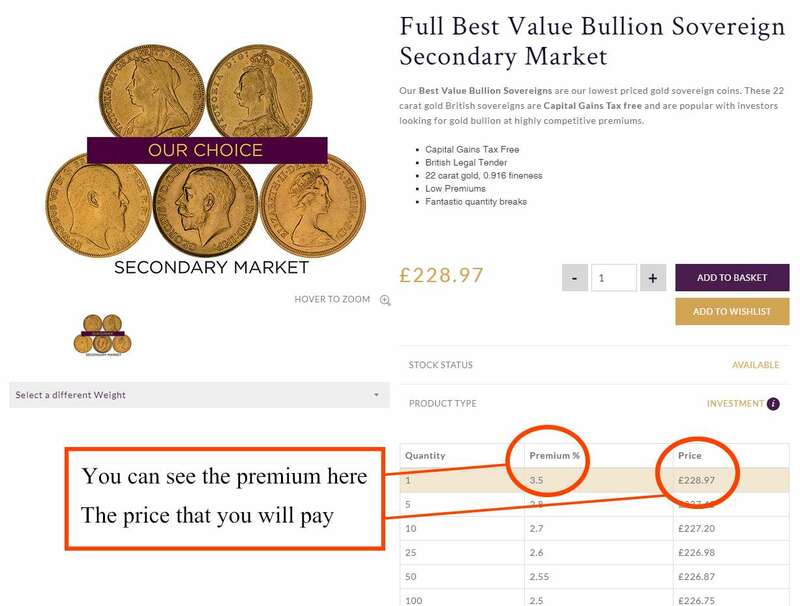 So, if you are looking to buy sovereigns it may be worth making a larger investment and paying a smaller premium. If you are unsure, contact us and we will help you to get the best deal. We love to give you more gold for your money! If you have sovereigns that you are looking to sell, you can check out the live price on our Sell To Chard page or contact us via phone, email or Live Chat on our website. Generally, most sovereigns that we buy are bought as bullion. However, if you have a coin that is in a high grade or is a low mintage or rare coin, we are always interested in buying them off you. We will need to physically see the sovereign, once we have assessed the condition and authenticated the coin, we will make you an offer. This is usually half the catalogue price but if it is a coin that we are particularly interested in, there are certain circumstances where we will pay more. Older secondary market sovereigns were minted with a higher concentration of silver which can make them appear more yellow (gold) than the modern sovereigns issued after 2000. Sovereigns issued from 2000 to now have a higher percentage of copper as the main alloy. This gives them a more reddish or coppery tone which can be confusing for buyers. 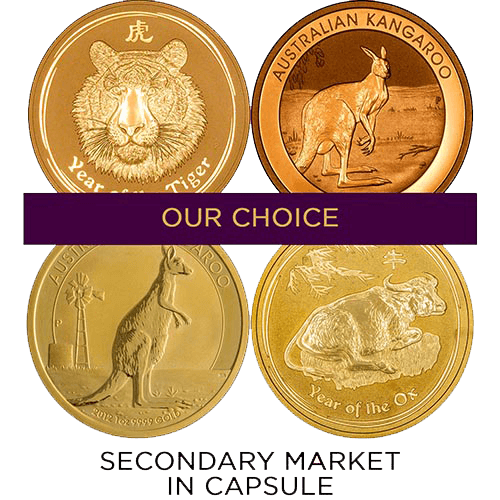 Well, you may pay a lower premium when you buy our Best Value Secondary Market 1 oz gold coins which is great for investors looking to buy a larger coin. We do find that a lot of investors like the flexibility of a sovereign. If there is the need to liquidate the investment, you don't have to sell the whole one ounce coin. New coins which we buy direct from various mints or brokers attract production, distributor and delivery costs which is why specific coins may be more expensive than our Best Value coins. 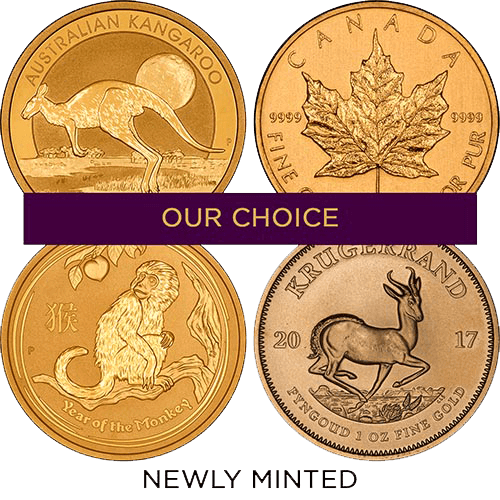 If you are not sure whether you want a one ounce coin or a different weight, check out our other options in our Special Offers. * Premiums do change according to our stock levels. If we have bought a large quantity of a particular coin, we often offer our subscribers access to secret offers which may not appear on the main website. Sign up to our mailing list so that you don't miss out.